Each sleeve for 4x6 features tab strips on back, just peel and place. Availability: Ships promptly! Keep photos safe with these clear archival photo sleeves! Pressure-sensitive acrylic adhesive positioned behind the sleeve will not dry out. Each sleeve fits perfectly over photos up to 4x6"
Passes the American National Standards Institute Photo-Activity Test (the PAT). 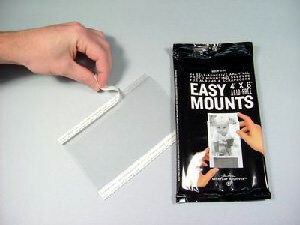 Tested by Wilhelm Imaging Research, Inc.
Quickly slip a 4x6" photo inside an Easy Mount. 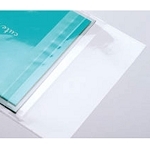 Remove the adhesive backings and place inside your scrapbook album! It's easy & safe to keep your photos nice. You can also use these sleeves for simple and safe, archival storage and processing of 4x6 photos, postcards, and recipes. Have you ever seen photos with adhesive on their backs? They're difficult to remove and often the acid in the adhesive or mounting paper does harm to the photo! The best way to mount photos is to use not adhesive touching it directly. These plastic mounts are easy to use and they're safe. Just slip your photo inside. When you are ready to place the photo inside of your album, simply remove the adhesive liners and place it on the page where you want it to be. It's easy. It's safe.These archival 4" x 6" Easy Mounts are made with photo-safe polypropylene and will never harm your images. These acid-free, easy-to-use sleeves also protect photos from dust, scratching, and fingerprints. You don't need to use the self adhesive feature - you could just use these archival holders for photos and postcards up to 4x6" in size. It's a bargain to see these archival sleeves at such a great price. Take advantage of the opportunity, since there's a limited quantity available. Per pack of 24 sleeves. Limited to stock on hand.